A few years ago, Instagram introduced a new contact option for business pages that allowed them to add their phone number and invite followers to text them directly. When users click the text button, their SMS app launches with the business number automatically pre-loaded as the recipient. Shockingly, not many retailers know about or use this feature, despite the immense value it adds. 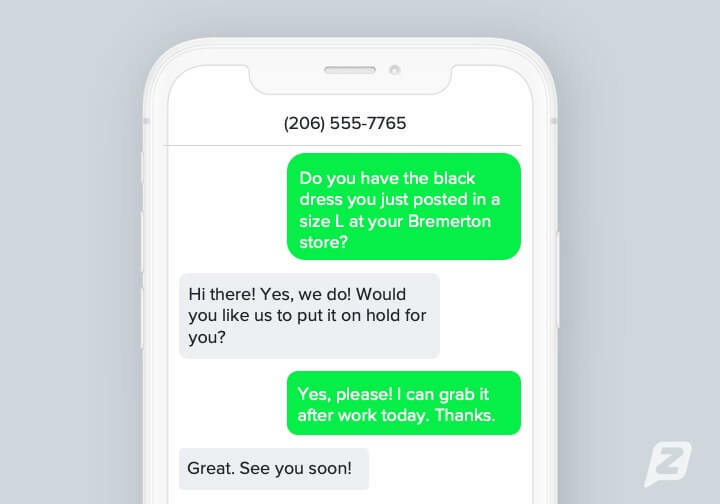 Text-enabling a business phone number is actually really simple if you implement a solution like Zipwhip with same-day setup and intuitive tools like multi-user functionality. As a stand-alone communication channel, texting has higher response rates, better open rates and more conversions. In fact, businesses report a 328% increase in sales conversions when using texting to nurture relationships. Customers prefer to text you – let them. Follow our instructions on how to add your business number to your Instagram account. It’s easy and fast. Your customers want to text you, so the conversations will come naturally. As soon as you add a text button and notify your followers about the addition, you should start seeing an influx of messages. Texting gives customers a fast, easy way to engage with your business. They don’t have to wait on hold, can respond on their own time and seamlessly switch over to voice call if necessary. It’s the most convenient way for your customers to get in touch directly with your store.